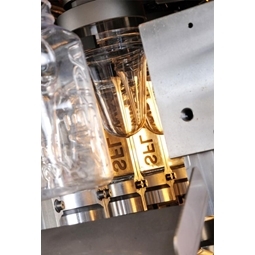 Italian blow moulding machine manufacturer SIPA has released new two stage SFL WM linear blow moulders designed for wide mouth bottles and other containers up to 10 litre capacity, which are now available locally from HBM Packaging & Plastics Technologies . Two configurations of the linear blow moulders are available. SFL WM Fast linear blow moulding machines have been designed with speed in mind, offering output rates of up to 6,000 containers per hour. These machines are suitable for producing containers with neck diameters up to 95mm, and capacities up to 3 litres. The second configuration, SFL WM Flex blow moulders, are intended for customers who change their containers more frequently. These machines hold up to four cavities and can make containers of up to 10 Litres with neck sizes up to 130mm. Mould changeovers take less than 20 minutes and neck changeovers take only 40 minutes. Both configurations are fully electric and low maintenance. They have low energy consumption due to their high reheating efficiency, and an Air Recovery System (ARS) that features reduced blow air consumption. Further, this ARS corresponds to a smaller compressor size requirement, further reducing energy consumption. SIPA are represented in Oceania by HBM Packaging & Plastics Technologies.